Mystery of the Charles River Seal - Partially Solved! 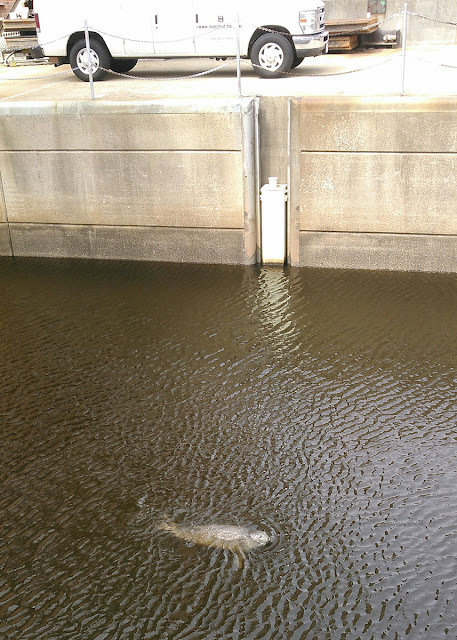 The mystery of the seal galavanting about the lower basin of the Charles River over the past ten days has been partially solved as an adult harbor seal popped up in one the locks of the Charles River Dam early Monday afternoon. The DCR dam and lock complex below the Zakim Bridge allows for the passage of boats between the differing water levels of the freshwater Charles River and saltwater of inner Boston Harbor. Dam operators noticed the plump, gray-spotted seal swimming at the water’s surface, took some pictures and called the Aquarium. Aquarium staff identified the species, its approximate age and good body condition and then asked DCR to open the harbor-side gate to release it. First spotted by staff at the Museum of Science on April 1, he was seen in the lower basin of the Charles over several more afternoons. Last week, it adventured further up river and was seen among the docked yachts on the Cambridge side of the Charles and later all the way to the BU Bridge. At the time, all of the images were from a long distance, and the seal’s species or approximate age could not be discerned. Among the likely suspects was a yearling harp seal visiting from Canada for the winter or a juvenile grey seal from Cape Cod. Young, inexperienced marine mammals are often prone to wrong way adventures, but the images of a relaxed adult harbor seal might change that story line in an unexpected way. Plump harbor seal after an easy meal? This seal most likely entered the Charles in a school of spawning fish that swam through the locks. It would have later discovered that large freshwater fish like carp, bass and perch were easy pickings as they would normally have no fear of a larger predator in the river. A seal can remain healthy in freshwater for a couple of weeks or more, but with a prolonged stay its blood chemistry could go out of balance as it would lack the salts that it passively ingests from sea water. To add to the mystery is that another unidentified seal was believed to have passed through the locks from the Charles to the harbor on Saturday. There could have been two seals, but with Monday’s animal being an adult, a local resident species and acting quite relaxed while caught in the lock, Aquarium staff speculate that this seal might have figured out that there is a regular, good food source on the other side of the dam. Just the way humans queue up in their cars on the overhead Zakim Bridge to make their living in Boston, it is possible that this harbor seal is willing to wait for the locks of the Charles River dam to open so that it can make a better, easier living as well. For walkers, joggers and boaters along Boston’s Esplanade or Cambridge’s Memorial Drive, spotting a seal in the Charles need not lead them to question either their eyesight or sanity. Aquarium officials would like to express their gratitude for the alertness and skill of the DCR dam operators in spotting the animal and successfully moving him through the dam complex. They had done the same for a fat, adult, male harbor seal in October of 2010. And thanks for your eagle eye, Katie! You may have been the first to bring this seal (or another clever hunter) to our attention last week. Thank you for looking out for animals of our blue planet. 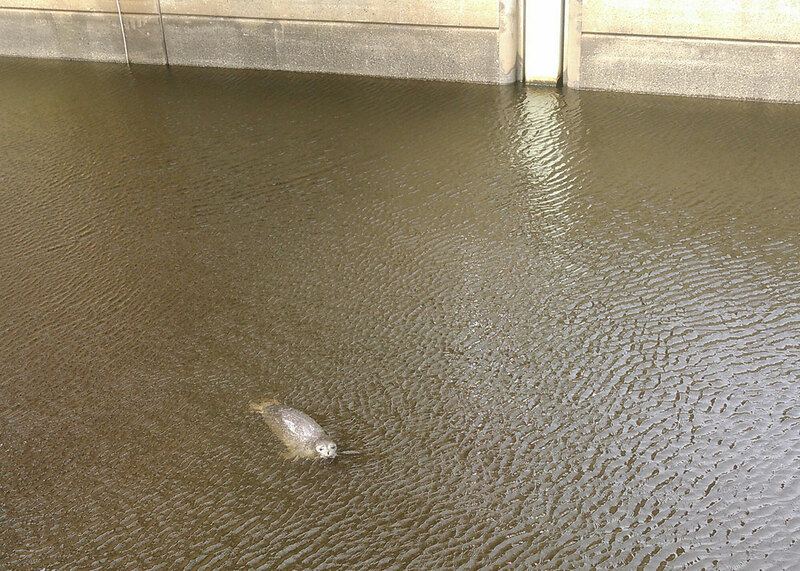 On Sunday around 11:00 AM I saw a seal in the Charles river all the way up by the Watertown Arsenal. Good morning! I spotted the seal lounging this morning on the docks by the community boating center. Seemed pretty content.